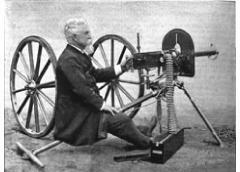 Hiram Maxim was the first person to build an automatic machine gun - one in which the operations of feeding, firing, extracting and ejecting were automatically performed by the explosion of cartridge [T1]. As he was developing this new field of engineering, he had no fund of previous experience to work from so he went through several prototypes as he gradually refined the mechanisms. 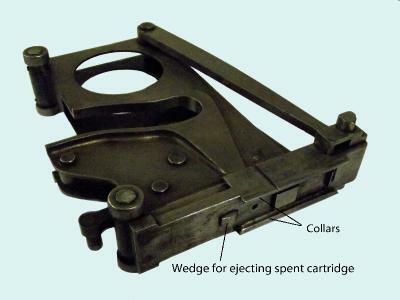 This web page traces the progress made to reach the ‘sliding cartridge carrier’ first realised in his Transitional design of 1885. 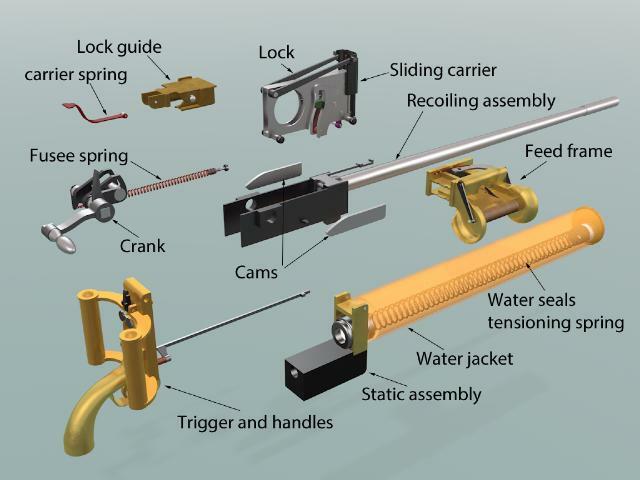 The Sliding Carrier principle was then used in all Maxim and Vickers machines guns thereafter. e. On recoil, clamps on the breech block grip the outside of the rimless cartridge to extract it into the second feed wheel which then rotates allowing the spent cartridge to fall away. This gun relied on a rimless cartridge of Maxim’s own design, which Maxim quickly realised would be impractical as all rifle calibre cartridges at the time had rims. His gun would have to use the same ammunition as issued to the Army. In his First Prototype (3844 23 February 1884 [T2]) design, he has modified his 2-feed wheel design to use standard rimmed cartridges. 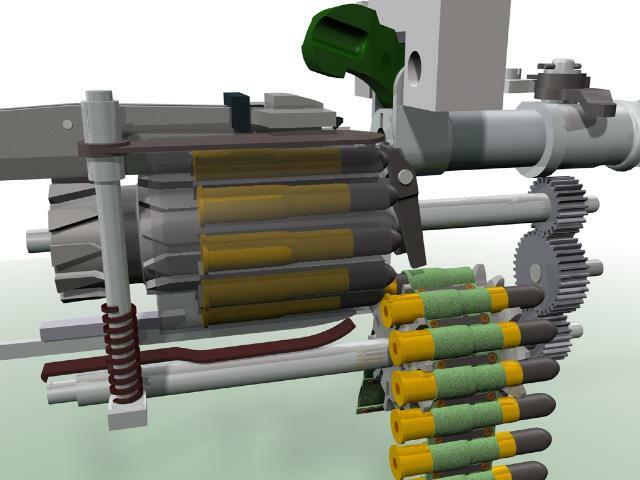 This image shows a cartridge being pulled back out of the ammunition belt on the lower feed wheel into the lowest slot of the upper feed wheel. 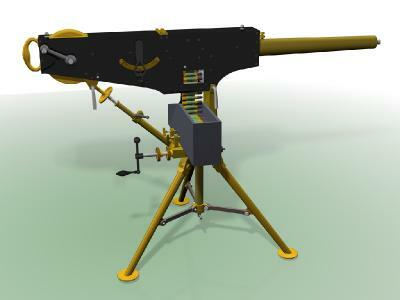 To prepare the gun for firing after loading an new belt, it was necessary to cycle the firing handle 6 times to get the first live cartridge into the breech. 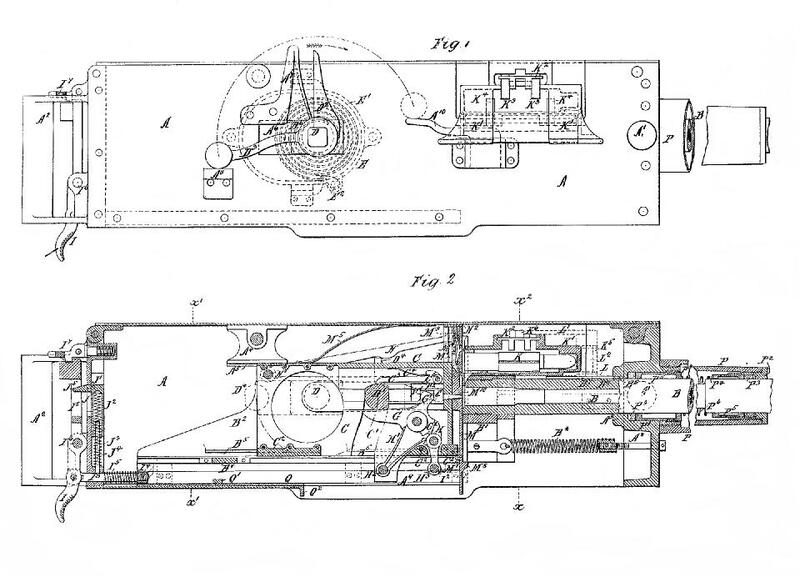 In his second prototype design (Patent 1307 February 14 1885 [T3]) Maxim has replaced the lower feed wheel, which drove the ammunition belt, by pawls carried by a transversely sliding plate, operated by a lever which is oscillated by the movement of the breech. 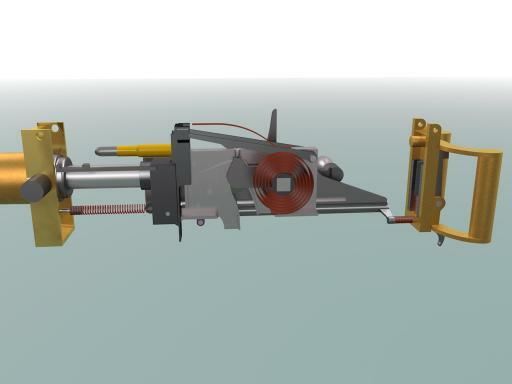 The belt is now positioned above the barrel, and on the recoil of the breech block a fresh cartridge is pulled from the belt directly into the feed wheel. This is rotated on each discharge, carrying the cartridges down to line up with the barrel. An animation of this gun can be viewed on YouTube here. Maxim was clearly not satisfied with his second prototype design. It is not known whether he actually built an actual example of the second prototype, but within 6 months he was awarded Patent 8281 July 8 1885 [T4], for a design referred to here as the Transitional design. In the transitional design he continues to use the belt feed mechanism, a sliding plate operated by the movement of the recoiling assembly. However, the feed wheel has been replaced by a sliding cartridge carrier attached to the lock. Ammunition is usually supplied in boxes containing 333 rounds. To load the gun, one end, with a long 'tongue' is fed through the feed block, from right to left and, while keeping tension of the belt, the hand crank is cycled twice. 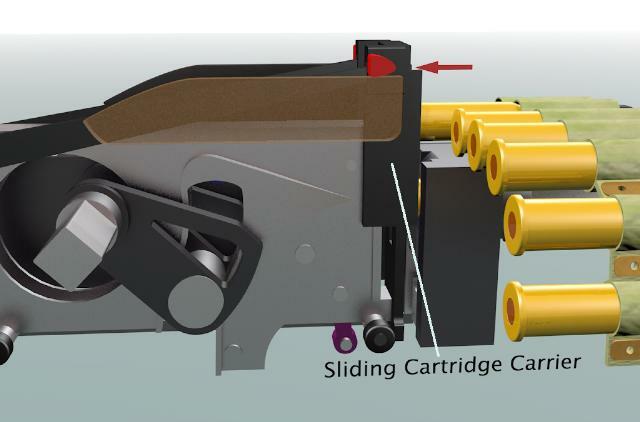 On the forward motion of the first cycle, the sliding cartridge carrier rises up to grab the first cartridge in the belt. 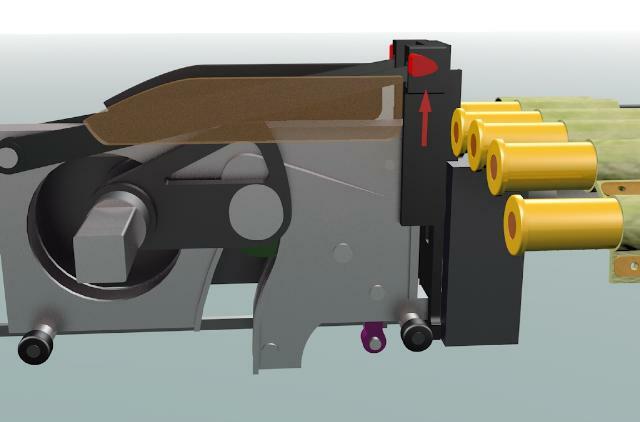 On the second cycle, that cartridge is transferred to the chamber of the barrel and the sliding cartridge carrier grabs the second cartridge in the belt. The gun is now 'in battery' and will fire as soon as the trigger is pressed. It will continue firing, at a rate of about 500-600 rounds per minute, until the ammunition is expended or the trigger is released. 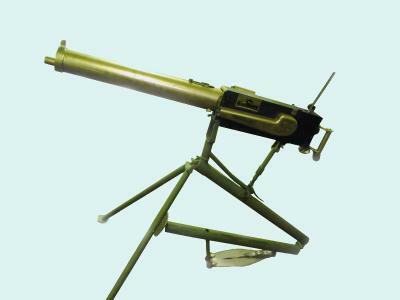 Maxim's guns are operated by the force of the explosion of a cartridge moving the 'recoiling assembly' to the rear. It is important that the breech is locked at the instant of firing, and remains locked for a short time to allow the bullet to exit the barrel and the gas pressure to dissipate. If the cartridge were allowed to be driven back out of the chamber of the barrel, gas pressure could burst the cartridge, which would cause, at the very least, a jam and possibly more serious damage. The breech is locked when the crank is in its fully 'home' position. The centres of the crank axle, the crank crossbar and the barrel (and cartridge) are all in-line. This is the 'knee' joint as used in the Winchester rifle, and later in guns such as the Luger. While the elements of a knee joint are all in-line the link is rigid, but if the joint is displaced slightly, the link collapses. 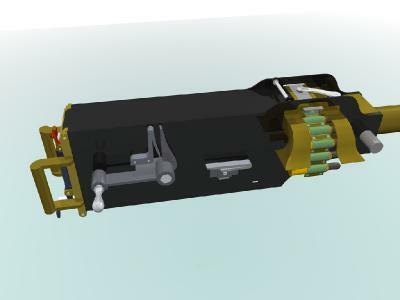 The crank is carried in the inner frame of the recoiling assembly, which is attached to the barrel, so with the crank fully home, the lock is held rigidly against the rear of the barrel. 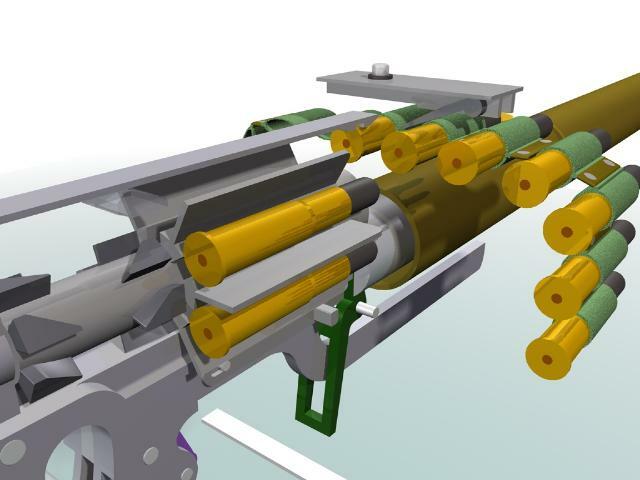 Now when a cartridge is fired, the whole recoiling assembly starts moving to the rear. After the assembly has moved a short distance, an arm on the crank hits a fixed 'resistance' attached to the frame of the gun and the crank starts to rotate - the knee is now broken and as the crank rotates, it moves the lock unit to the rear allowing a fresh cartridge to be pulled from the belt and the spent cartridge extracted from the barrel. As the crank rotates, it tensions a spring known as the Fusee spring. Maxim noted that when a spring is entended it applies more force than when it is is its rest position. However, on the return stroke Maxim needed the maximum torque on the crank as this was driving the sliding cartridge carrier upwards to grab a fresh cartridge. The fusee, therefore has a shaped arm which wraps a chain attached to the spring. When the crank is at its rearmost position, the crank experiences a small torque, but as the crank returns towards its 'home' position the point at which the chain acts moves outwards, so increasing the torque. The sears are the catches that hold or release the hammer. The Transitional machine gun has two sears. One is operated by the trigger. When the trigger is released, the trigger sear engages in a cutout in the hammer, preventing it from driving the firing pin onto the cartridge. The other sear is operated by the crossbar of the crank. When the crank reaches its fully 'home' position, it lifts the crank sear which is holding back the firing pin. 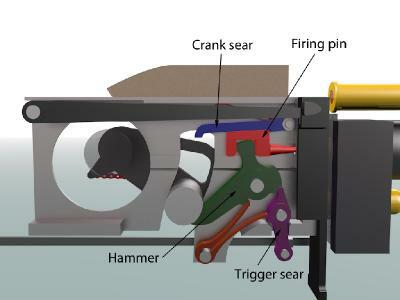 It will be seen that if the trigger is pulled, the trigger sear is kept clear of the hammer cutout and the hammer is held back only by the crank sear, so that immediately the crank returns to its fully home position, the firing pin is released and the next cartridge is fired, and the cycle repeats. When the trigger is released the hammer is locked, so that lifting the crank sear by the crank does not fire the next cartridge. 1. Extract - where the lock moves backwards due to the recoil of a discharge. 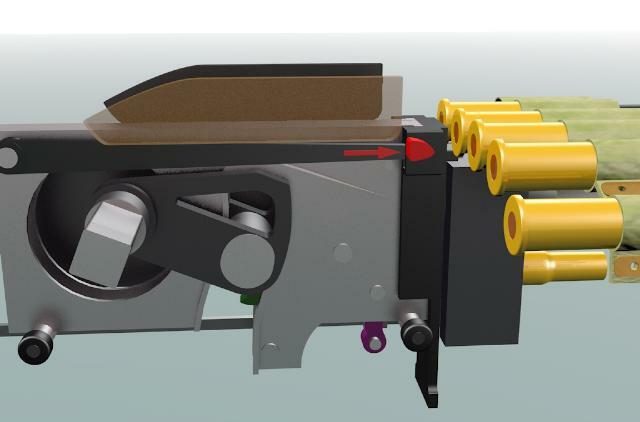 The sliding carrier pulls a new cartridge from the belt and at the same time extracts the spent cartridge. The hammer is also cocked during this motion. 2. 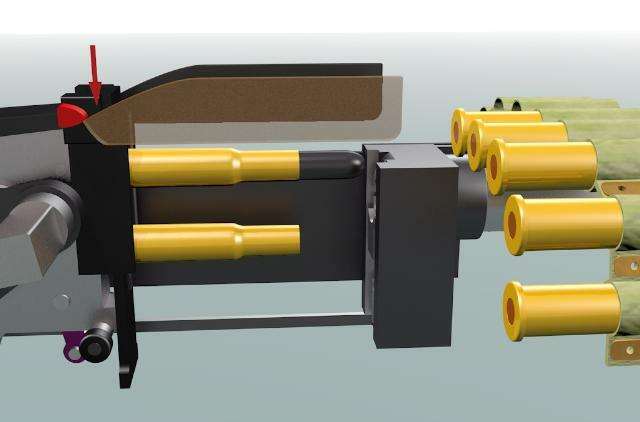 Drop - when the lugs on the sliding carrier reach the end of the fixed cams, the whole carrier drops, assisted by a spring, so that the new cartridge is aligned with the barrel and the spent cartridge to the eject tube. 3. Load - the lock is driven forwards by the Fusee spring, placing the cartridge in the barrel. 4. Fire - the sliding carrier is forced upwards by the cams on the crank. This aligns a hole in the sliding carrier with the firing pin. The collars on the carrier grab a fresh cartridge, and the spent cartridge, now free of the collars, is kicked forwards by a ramp machined on the sliding carrier. As the crank is fully aligned with the barrel, it lifts a sear allowing the hammer to fall onto the cartridge in the barrel, and the cycle repeats - at 500 to 600 round per minute. Maxim displayed his Transitional gun to ‘everybody in London interested in such matters’ in order to gain support for sales of his gun. Maxim’s biographer P Fleury Mottelay noted that “‘Society’ , including members of the Royal Family, Dukes and many other distinguished people made a pilgrimage to Hatton Garden in order to fire the new gun, and more than 200,000 cartridges were expended for the amusement of the smart set.” [T5]. The Transitional machine gun was superseded in 1888 by Maxim’s ‘World Standard’ machine, with the first orders being sent to Austria. Shortly after that, the popularity of the gun made it necessary to enlarge the manufacturing premises, and Maxim’s company merged with Nordenfelt’s in order to use their factory at Erith. It is interesting to note the continual development of Maxim’s ideas during the period 1885 to 1887. Patent drawings are only an means of illustrating a patented idea. The drawings for the Transitional gun patent differ significantly to the remaining example of the gun and photographs. 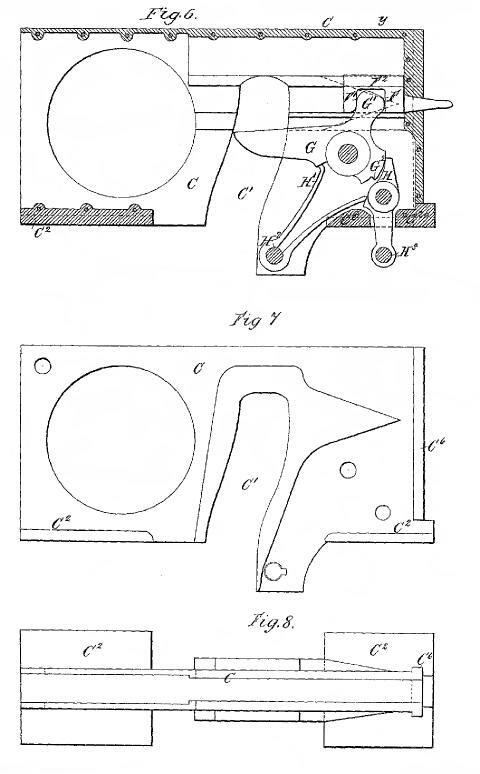 In particular, the Patent shows the crank working against a clock spring, while built examples use the Fusee, first patented in the Second prototype patent [T3]. The other significant change was the introduction of ‘Cams’ attached to the sides of the static frame to control the vertical motion of the sliding carrier. 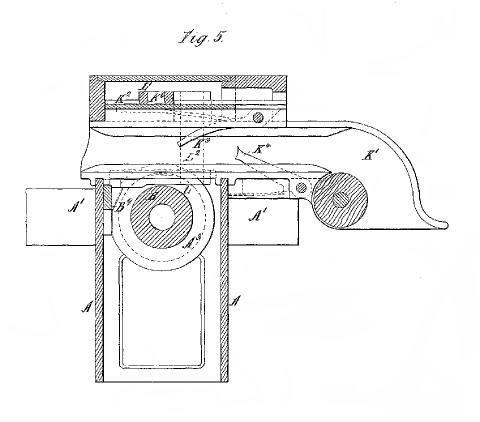 In fact Patent 8281 does not mention this feature - the sliding cartridge carrier being depressed when the fresh cartridge has been extracted far enough to clear the rear end of the barrel by a spring. The ‘roll-over’ images above show the gun as described in the patent, and when the mouse is rolled-over, the gun as produced.